I was looking through the cupboard thinking of what to make for sweets after dinner. I saw some polenta and I thought "polenta pancakes". I didn't have a recipe I go by feel and texture when I make pancakes. These pancakes turned out crisp on the outside and fluffy on the inside. They had a very intenste corn flavour due to the cornmeal and the cornflour and were yellow on the inside. 1. Place polenta and milk powder in small bowl, pour hot water mix and wait for 10 mins until the water has been absorbed by the polenta. 2. Mix and shift the flours, salt, sugar, baking soda and baking powder into a medium bowl. 3. 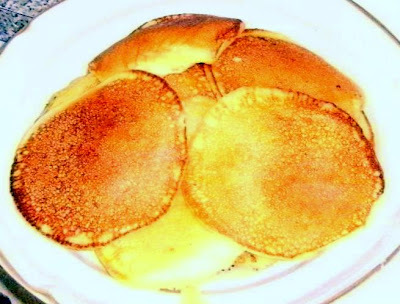 Make a well in the centre of the flour mixture add the beaten egg and the polenta mix and stir until smooth and free of lumps and has the consistency of normal pancake batter. Add the extra cream (or milk) if the batter is too stiff. 4. Lightly grease a pan and use ¼ cups of batter and fry until bubbles form and then turn and cook for 1 minute. 5.Place onto covered plate in warm oven and proceed to finish the batter. 6. Serve with jam and whipped cream. I would not have thought that polenta would have made a light pancake! I like polenta but have never had it as a sweet...I'll try this on my hceat day! Are you okay with the fires there? Linda at RemoteTreeChanger has smoke, but says the fires are a ways off from her...hope you are doing well. Very nice looking polenta pancakes. They look delicious. I hope you're not effected by the fires.